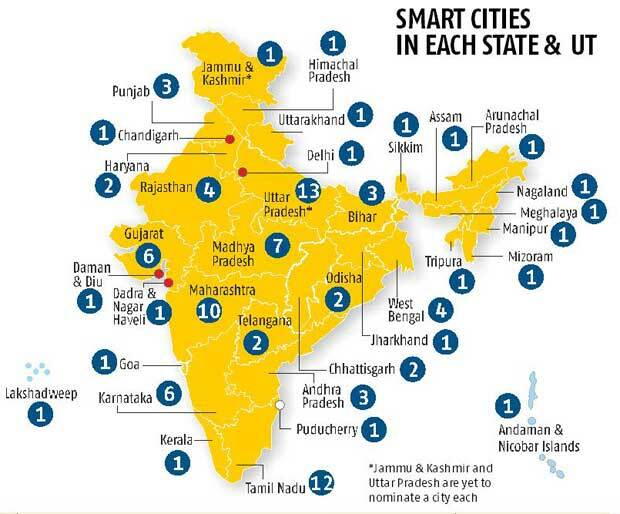 Bengaluru and Kolkata are among the top cities that did not make it to the list of 98 that have been nominated for the government’s ambitious Smart City project. Only the Lutyens zone covered by the New Delhi Municipal Council has been named as a contender, leaving out the larger part of Delhi under the Municipal Corporation of Delhi. Other prominent cities that failed to make the cut are Shimla, Gangtok, Patna, Thiruvananthapuram, Puducherry and Itanagar. Even Gurgaon and Noida, seen as technology hubs, are not part of the list. Chennai is the only metro city named as a whole to be a part of the project, while pockets such as Navi Mumbai, Greater Mumbai, Nashik and Thane have made it to the list. Also, New Town, a satellite town to Kolkata, has been selected. Uttar Pradesh, which had the largest quota of cities at 13, has nominated 12 so far. There is a tie between Meerut and Raebareli in the first phase of the city challenge competition. The 12 include Prime Minister Narendra Modi’s constituency Varanasi, along with Lucknow, Agra, Allahabad and Kanpur. Tamil Nadu, a close second with 12 nominations, has listed Chennai, Madurai and Coimbatore among others. Madhya Pradesh’s list of seven includes Bhopal, Indore, Jabalpur and Gwalior. Gujarat has named its quota of six, including Gandhinagar, Ahmedabad, Surat and Rajkot. Union Urban Development Minister Venkaiah Naidu announced the names at a press conference here on Thursday. These 98 cities will now compete for the second stage of the challenge. Jammu and Kashmir is yet to nominate a city and Uttar Pradesh has named one less than its quota of 13, making it a list of 98 instead of 100. The next phase of the city challenge competition will be critical as only 20 of the nominated cities will make the cut for the first round of the project. The top 20 with highest scores across parameters such as service levels, infrastructure, track record, execution proposals and population will be eligible for Rs 200 crore of central funds each in the first year and Rs 100 crore each over the next three years. States, municipal bodies as well as private players will chip in too. Subsequently, other cities will be given time to improve their scores and enter the next round of the competition. According to Pratap Padode, founder and director, Smart Cities Council India, cities that have been left out in the current nominations can still make it in the following rounds. Similarly, some of the cities nominated now can be eliminated at any stage, depending on their scores as they go along. Congress MP from Silchar, Assam, Sushmita Dev has accused Sarbananda Sonowal, Union minister of state (independent charge) for sports and youth affairs, of misleading the people of her town by promising them a Smart City just before the Assembly by-polls in September. The Congress government of Assam had recommended Guwahati but it was ignored. 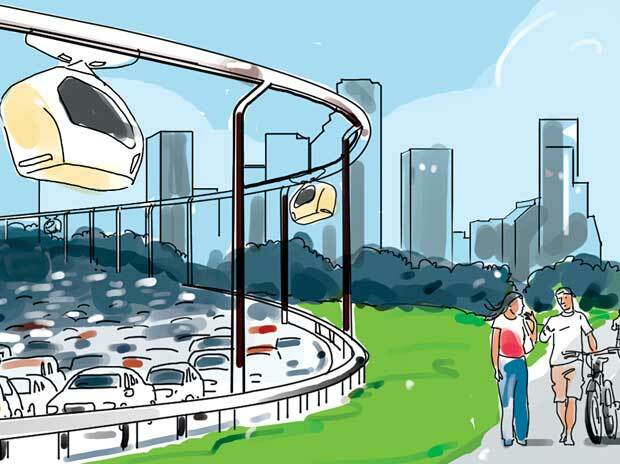 After the list of smart cities was declared on Thursday, politicians claimed to detect political motives in it. Delhi recommended the centrally administered New Delhi Municipal Council area. In Uttar Pradesh, the toss up is between Meerut and Raebareli, Congress President Sonia Gandhi’s seat. The list of 98 includes 24 capital cities, 24 business and industrial centres, and 18 that have cultural and tourist significance. Also cities known as education and healthcare hubs as well as port cities have been nominated. For example, in Bihar, Patna has been left out while Bihar Sharif has made it. In Himachal Pradesh, Shimla has been left out while Dharamsala has been nominated. “Clearly, this is a move to ensure more equity for smaller centres,’’ Chandraker said. Several companies are in discussions or have signed pacts with stakeholders, including states, to be a part of the Smart City project. But experts have concerns regarding the project’s financial feasibility. “With most state governments facing severe budgetary constraints and the finances of most municipalities being in a precarious condition, it remains to be seen how the Smart City scheme becomes financially sustainable,” Guha said.